A few days ago, U.S. President Donald Trump made a move that threatened the United States and Russia collaboration in Syria, and Hillary Clinton is all for it. Trump ordered missile strikes on the Shayrat airbase because it was apparently used to launch a chemical weapons attack on a rebel-held town. The area in the Idlib province led to the deaths of more than 80 people. Trump’s basis for ordering the strike was the alleged use of chemical weapons by the Syrian regime, which is presently supported by Russia in the fight against rebel groups. But according to Russia, the exposure that led to the deaths was due to the bombing of a nearby chemical weapons facility operated by terrorists. According to Maj Gen Igor Konashenkov, spokesperson for the Russian defense ministry, Trump’s assumption about the Shayrat airbase was wrong. According to Konashenkov, no evidence has been brought forward by the U.S. supporting the allegations. The following were his exact words concerning this. “None of those at the airfield wear gas masks and they all feel perfectly normal. The question [of chemical weapons at the Syrian airbase] thus arises: who once again slipped something in to yet another US president [Trump] as ‘evidence’ of the existence of ‘chemical weapons’ in a country Washington objects to, and what exactly was it? Operations on the site, which was bombarded by Tomahawk missiles from the USS Ross and USS Porter warships, have resumed, with the results being somewhat mixed. According to Iran’s President Hassan Rouhani, Trump’s decision to bomb the Syrian airbase made terrorists very happy, as he indirectly aided them in their fight against Syria’s President Bashar al-Assad. The following was his statement on the country’s state television as reported by the BBC. This has brought about the question of whether the information obtained by the U.S. to justify the bombing was credible. Delving a bit into past related blunders, the Iraq invasion, for example, resulted in the deaths of about 500,000 Iraqis. Today, it has been observed that the killings in Baghdad, its capital, have gone down, but ethnic cleansing is said to be the main reason behind this. This is according to a report by MIT. 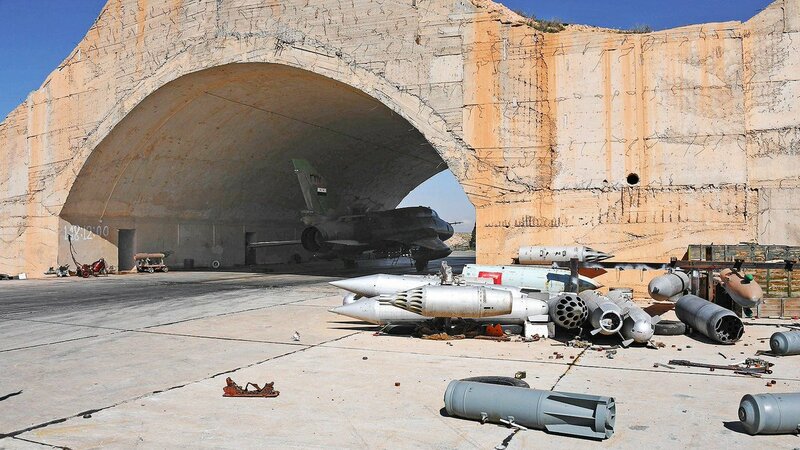 We wonder how come no chemicals were spread after 23 US rockets hit the Shayrat airport where supposedly Syrian army stored sarin gas?! In an extraordinary coincidence, Hillary Clinton had called on the United States government to bomb Syrian airbases just hours before the strikes on Shayrat. This was while in an interview at the Women in the World Summit. Of course, Hillary Clinton has always publicly supported the notion of usurping Syria’s President Assad from power. But another coincidence worth noting is that Hillary Clinton also supported George W. Bush’s Iraq invasion on a sham. It led to the deaths of hundreds of thousands of civilians. That said, Trump’s latest executive order in Syria definitely warranted deeper investigations before action, especially now that more and more American indiscriminate airstrikes in Syria are leading to a significant number of civilian casualties. On Saturday, 21 people, including a woman and her six children, were reportedly killed in an airstrike in Syria led by U.S. coalition forces. This is as reported by CNN.